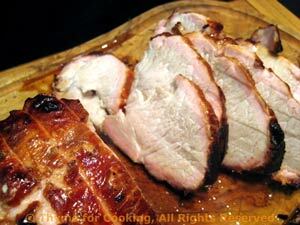 Brined and Grilled Pork Loin, Thyme for Cooking easy gourmet dinners. 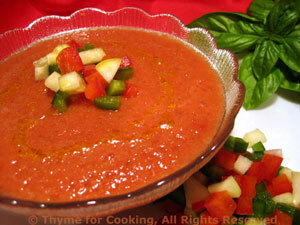 This started as Traditional Gazpacho, but I found that I preferred it without the bread crumbs. If you want to stay with tradition, add 1/2 cup of bread crumbs and enough water to thin to the consistency of a thick, cream soup, to the blender. Peel the cucumber, onion and garlic. Roughly chop all of the vegetables, reserving 1 heaping tbs of the cucumber, onion and pepper, and 2 tbs of the tomato for garnish. Chop the garnish a bit more. Put the rest of the vegetables along with the remaining ingredients, except olive oil, into a blender and purée, in batches if necessary. When smooth pour into a bowl. Taste and adjust seasoning, adding salt, pepper, a bit more vinegar or sherry as desired. 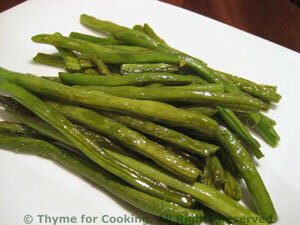 Serve with the reserved chopped vegetables on the side as garnish to be added by each diner along with the olive oil. Brining pork adds moisture and flavor, making what can be a somewhat dry cut, tender and succulent. It's easy to do and there's a lot of leeway on the timing: more than 6 hours but less than 24. If you don't have a deep enough bowl, try a saucepan or even a food bag that seals well. Use an 'instant read' meat thermometer. Earlier in the day, at least 6 hours and up to 24 hours before cooking: Put salt, sugar, molasses and paprika in a deep bowl. Add coffee and mix well. Add water and stir until sugar and salt are dissolved. Add garlic and ice, stir. Add pork; you should be able to completely submerge it (although it will float). Cover and refrigerate. Turn once or twice during the day if you think of it. When ready to cook, remove pork and cook on barbecue grill on indirect medium heat for 45 - 60 minutes, turning to brown all sides. Cook until 145F (62C) or until only pale pink in center. Remove and let rest 5 - 10 minutes. Slice half of it (or less) and serve. This uses the best of the summer garden: fresh tomatoes and fragrant herbs. 6 - 8 hours is the perfect time for the sauce to blend flavors. The olives tend to loose flavor after a day, so I don't plan leftovers with this. Peel tomatoes and roughly chop. Put into a large bowl. 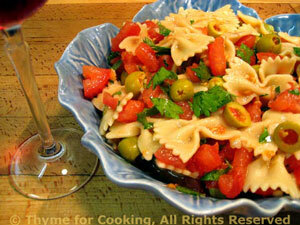 Cut olives in thirds and add to tomatoes. Pour olive oil over all, stir to combine. Cover with plastic wrap and let sit at room temperature for at least 2 hours, 6 or 8 is better. Cook pasta according to package directions, drain and add to sauce. Note: If you cook the pasta ahead, drain and toss with 1 tbs olive oil. Combine with the sauce when ready to serve - or before leaving on your picnic. Note: The tomatoes, etc. need to sit without the pasta for the sauce to develop and the flavors to meld. A simple preparation to highlight the best of summer vegetables. Adding a bit of oil to the butter prevents it from browning or burning. Top and tail beans but leave whole. Heat butter and oil in a skillet large enough to hold the beans without cutting. Add beans and sauté over medium heat until starting to brown and blister, 7 - 9 minutes. Sprinkle with salt, remove and serve.